BEFORE YOU READ ANY FURTHER...THIS IS NOT A POST ABOUT PACKING IN A CARRY ON. Okay, just wanted to make sure that was clear. Hats off to those who can do it. Maybe one day I’ll get there. First, I guess we should define what a long trip is. For me, that’s any trip that’s two weeks or longer. There might be other definitions but that’s how I quantify it. 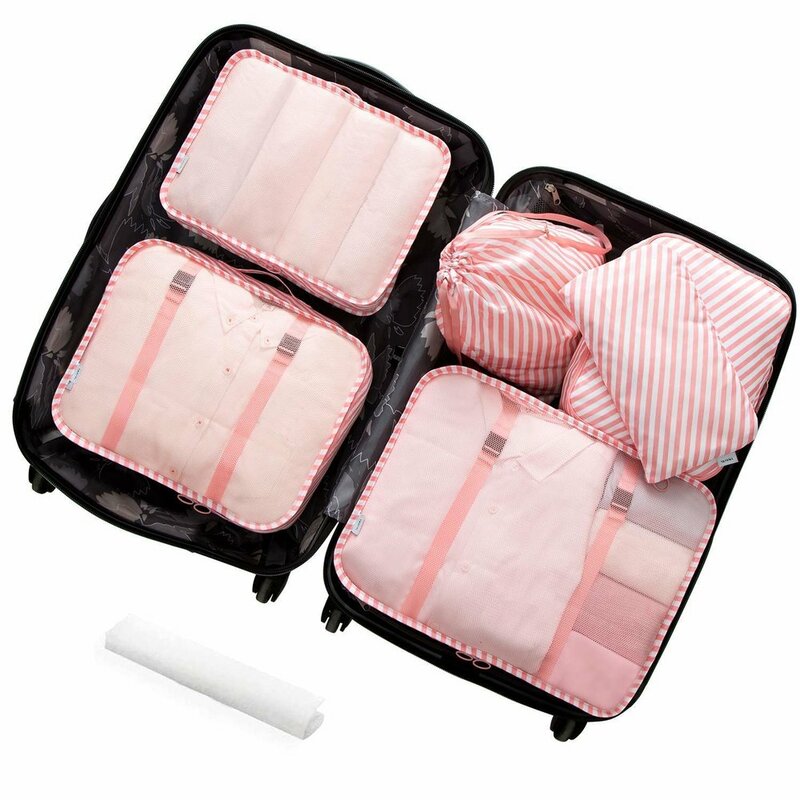 I prefer a hard sided suitcase with dividing sections inside to keep my clothes organized. I currently use the Delsey Camille 29 inch suitcase + a Delsey carry on. Sadly, the exact model isn’t sold anymore but I found a similar style on Amazon. If you’re into photography or you’re a travel blogger like me, I HIGHLY recommend a great gear bag. I fought it at first because I didn’t think they were “cute or fashionable” but sometimes you just gotta give in to practicality. There are A TON of options out there and it can be super overwhelming to make your decision. So here’s my advice. Don’t splurge on your first gear bag. You might have no idea what you really want or what features are important to you until you use a few and find out. It’s good and it totally serves its purpose. It’s great because it holds all my stuff and can fit some of my essentials that I normally would put in my purse. I love that it has a slot for my laptop and it’s got a side compartment for easy access to your camera. BONUS: it’s under $100. This is the gear bag a lot of other female travel bloggers carry and I want to sit at the cool kids table so I’m gonna get it too. LOL. Kinda joking but not really. Truly though, this bag is nuts. It’s got all the things a gear bag should have, plus it just looks so sleek and clean. I love that you can customize the storage inside to what you need. SO, when I just happen to have almost $300 laying around, I’ll be getting this cutie. Honestly, I don’t think I can ever travel without packing cubes. They are a lifesaver when it comes to organizing your suitcase. I use them to pack my underwear, bras, pjs, workout clothes and other non-wrinkle items. I love PurseN products! I discovered them when GMA did a Deals and Steals Segment and I was sitting in the Jury Duty waiting room bored out of my mind. So I hopped on and bought a makeup case and a jewelry organizer. I haven’t looked back since. Two words: broken jewelry. Yeah...it’s brutal when that happens. With this case, you don’t need to worry about that. I’ve been able to fit TONS of earrings, necklaces and rings into this tiny travel case. It’s amazing. Alright, you’ve got the goods, now you need to figure out what to bring. Step 1: Take anything you think you might want to bring and put it on a clothing rack in the middle of your room. This helps me separate my things from what’s already a jumbled mess inside my closet. Step 2: Organize outfits on the rack by day. I typically like to have an outfit for the day and an outfit for the evening. Again, you’re going to cut these picks down but it’s good to start with an organized framework for each day. When selecting your outfits, try, to pick items in the same color group. That way selecting purses, shoes, accessories, etc. is easier and you can pick things that coordinate. Step 3: Go through your outfits and see which ones can be worn more than once. Maybe there’s something that wrinkles easy and you don’t really need it, NIX IT! Once I’ve got my base outfits (dresses, skirts, pants, tops, etc) I choose my shoes, coats, purses and accessories. I will preface this by saying I brought so many dresses because I knew it was going to be HOT. Like 100 degrees everywhere we went. So I knew dressing in loose clothes was the only way I was going to be comfortable. That’s why I didn’t bring too many tops or pants. Consider looking into a Rent the Runway Unlimited subscription before your next trip! SIDE NOTE: Checking the weather before your trip is imperative. And while weird things happen, it usually gives you a good idea of what you can expect. Step 4: Pick your jewelry. I try to bring items that go with everything. I put it all in my PurseN Jewelry Organizer and I’m good to go. I like to keep my jewelry with me so I pack that in my carry on. Step 5: Once you’ve finalized all the clothes you’re going to bring, you’re ready to get packing! I put my no-wrinkle clothes (underwear, socks, bras, pjs, workout clothes) into the packing cubes. Those along with my makeup case go in one section of my suitcase. In the other section I pack all the dresses, pants, tops, etc. You’ll find different opinions on this but I prefer the minimal fold method. Meaning I lay each item flat and then fold it the least amount of times possible. I put my shoes in my rolling carry on bag because they’re usually heavy and I don’t want that counting towards my 50 pounds. Again, this isn’t the most convenient way to pack but it’s the way that allows you to bring as many clothes as possible lol. Step 6: Weight it! This is the part I hate lol. But it’s the most important. Get a reliable scale and see how you did. If it’s over, you gotta make some cuts, if it’s not you’re good to go. One of the best things you can do is check the airline allowances. Sometimes flights from the USA to other countries allow you to have 60 lbs instead of 50 lbs (that was the case for our Emirates flight from the US to Dubai). BUT if you have smaller flights within the country you’re visiting (our flight from Delhi to Chandigarh) you might have different baggage allowances. It’s literally different for each carrier so you should always check. Personally, I just pay for the overages if the smaller flights have more restrictions. I know it sounds crazy but that’s what I do. If you don’t want to do that, you’re going to have to make sure your bag is the weight of the more restrictive flight, even if you’re allowed 60lbs on the international flight. Step 7: Pack my gear bag. I might have more gear than the average traveler. I will be sure to do a post on what’s in my gear bag in the future. This is where all my cameras, laptop, chargers, wallet, cords, etc. goes. I save this for last because typically I’m using all these items right up until I leave for the airport. Side note: when traveling internationally be sure to check the weight allowances on carry on baggage. The restrictions can oftentimes be more strict than they are for domestic flights within the US. I’ve been burned a few times when I try to bring on my rolling bag and I’m told I need to check it. I hope this was helpful! Let me know if you have any questions on packing tips or travel tips in general. I’m here to help!